These mouthwatering short ribs are one of my go-to recipes when I know I’m going to have a busy day, but I want to enjoy a savory dish for dinner. They take just twenty minutes to prepare in the morning, and then I leave them in the slow cooker and let them cook all day until my family sits down to eat in the evening. There are three ways to butcher short ribs: English, flanken, and boneless. It’s cheaper to buy the cut with the bone still attached, and that’s certainly nothing to complain about as the bones give the sauce added flavor. In the flanken style, the ribs are thinly cut across the bone. Each slice ends up having a few pieces of bone. Ribs butchered English style are cut parallel to the bone. The English style works best for this dish (flanken style ribs need to be cooked quickly over high heat). I always recommend grass-fed beef as it’s healthier and contains more nutrients than its grain-fed counterpart. However, it sometimes can be difficult to find grass-fed beef in supermarkets (and often I’ve seen supermarkets overpricing these meats). That’s why I was delighted to discover US Wellness Meats. Their grass-fed beef is recognized for its exceptional taste, quality and health benefits, and you can order directly online from their website to have it delivered to your door. How easy is that? 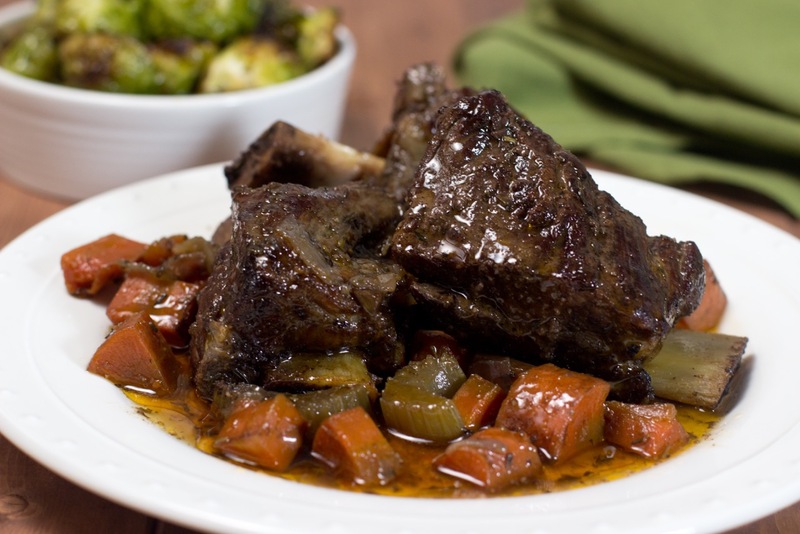 Braising is one of the most popular ways to cook short ribs. It turns the toughest and most inexpensive cuts into the most succulent meats you’ve ever tasted. First, the ribs are seared in a pan until they’re browned on either side. Searing the ribs extracts the collagen and breaks down the connective tissue, browning the outside and giving the meat an incredible depth of flavor. Then, the pot is covered, and the meat cooks in a sauce for several hours on the stove at a very low simmer, until it is soft and gently falls away from the bone when cut with a fork. The braising process can be quite time-consuming so if you use a slow cooker for the second step it can be left unattended. (If you’re looking to invest in a high-quality slow cooker, I recommend this one by Hamilton Beach). The ribs simmer slowly all day while you tackle the other things on your to-do list. When you Ireturn at the end of the day, the most delicious beef awaits you. Get the full recipe at The Gluten Free Homestead.